Upper eyelid ptosis is a drooping of the upper eyelid margin in relation to superior limbus. This problem can have significant functional and aesthetic implications. Because it can be a difficult problem to correct, a variety of procedures have been developed to address ptosis. The image below depicts a procedure used to correct upper eyelid ptosis. Blepharoplasty, upper lid ptosis surgery. Intraoperative photo of levator muscle. The use of fascial slings to suspend the upper lid from the frontalis muscle was originated by Payr  and Lexer  and later adapted by Risdon. Tillett and Tillett  and McCord and Shore  suspended the ptotic lid in a similar fashion but employed silastic strips rather than fascia. Anterior approaches to the levator using a blepharoplasty-type incision allow resection of a portion of the levator aponeurosis and tightening. Further evolution has led to techniques that use adjustable suture plication either alone or in conjunction with aesthetic blepharoplasty. Upper eyelid ptosis is a lowering of the upper eyelid margin in relation to superior limbus. Normally, the eyelid covers 1-2 mm of the upper limbus of the cornea. When the ptotic lid covers enough of the upper limbus or pupil it can result in both functional and aesthetic deformities. The severity of ptosis is classified by determining how much of the upper limbus is covered by the lid margin: mild is 2 mm, moderate is 3 mm, and severe is 4+ mm. Levator function is classified based on the distance of lid margin excursion: excellent is 12-15 mm, good is 8-12 mm, fair is 5-7 mm, and poor is 2-4 mm. The frequency of upper eyelid ptosis is difficult to determine. However, it is increasingly recognized in the elderly population. This is particularly true in patients who have undergone cataract extraction or lens replacement, perhaps due to stretching or disruption of the levator muscle when the eye is propped open using retractors. Congenital ptosis typically involves isolated myogenic dystrophy resulting in an underdeveloped levator muscle with poor functions. Congenital presentation also can include neurogenic origins such as cranial nerve (CN) III palsy and Marcus-Gunn pupil. Acquired ptosis also can be of neurogenic pathology and include acquired CN III palsy and Horner cervical sympathetic nerve palsy. In older patients, myogenic ptosis is caused by a thinning, lengthening, or, less often, disinsertion of the levator aponeurosis from the tarsal plate. In addition, acquired muscular dystrophy, progressive external ophthalmoplegia, and myasthenia gravis all can be causes of late-onset ptosis. With the exception of the neurogenic and myasthenic types of ptosis, levator function is usually good in acquired ptosis. Traumatic ptosis varies according to the location of the injury to the levator muscle or lid mechanism. Mechanical ptosis is due to a tumor, cyst, or enlarged lacrimal gland pushing down the eyelid. Pseudoptosis refers to the drooping lid skin of blepharochalasis and to the apparent ptosis seen in the postenucleation eyelid. Ptosis of the eyelids can have a subtle presentation and even go unnoticed by the patient. Presenting signs include a high tarsal fold, persistent wrinkles in the forehead due to contraction of the frontalis muscle, and asymmetric elevation of the eyebrows, greater on the affected side. In severe cases, patients complain of restricted visual fields. Patients presenting for cosmetic surgical procedures on the face also may demonstrate some degree of upper eyelid ptosis. In apparently unilateral cases, the "normal" appearing eye is checked by closing the affected one to see if a milder degree of ptosis is noted. Many techniques have been used to correct upper eyelid ptosis. Consider the degree of ptosis and levator function when weighing surgical options. Patients with poor levator function (< 10 mm of excursion) and moderate ptosis (< 3 mm) will likely require suspension of the lid from the frontalis muscle. Patients with poor levator function but severe ptosis (4 mm or greater) are managed with resection of a segment of the levator muscle. Patients who have good levator function (>10 mm excursion) can obtain long-term correction of the ptosis using plication of the distal levator muscle aponeurosis. Patients with minor ptosis (< 2 mm) and good levator function (>10 mm excursion) are candidates for the Fasanella-Servat mullerectomy. In addition, when these patients also are undergoing cosmetic facial surgery, they can be treated successfully with transpalpebral blepharoplasty plication of the levator aponeurosis. In most of these patients with senile ptosis, simple plication of the levator may suffice. The upper eyelid is divided anatomically into the anterior lamella, comprising skin and orbicularis muscle and the posterior lamella, which consists of the tarsus and conjunctiva. The upper eyelid is further divided by the supratarsal fold into tarsal and orbital segments of the orbicularis muscle. The supratarsal fold is formed by the insertion of the levator aponeurosis and the orbital septum on the deep surface of the orbicularis oculi. These layers, which make up the pretarsal fascia, insert into the anterior aspect of the tarsus and fix the structures of the anterior and posterior lamellas. The levator muscle, which is approximately 45 mm in length, is a skeletal muscle under voluntary control of CN III. It originates within the apex of the orbital cone and inserts on the levator aponeurosis. The levator aponeurosis extends for 12 mm superior to the supratarsal fold between the levator muscle and Müller muscle. Müller muscle is a smooth muscle under control of autonomic system, which lies beneath the aponeurosis adjacent to the conjunctiva. Failure to recognize the complex anatomy of the thin, mobile upper eyelid can lead to injury of the levator aponeurosis during cosmetic blepharoplasty while trying to locate the supraorbital fat pads. Because ptosis correction can be performed under local anesthesia, with proper operative selection there are no specific surgical contraindications to surgery. Purely cosmetic procedures should be avoided in patients with dry eye syndrome. Patients who are undergoing concomitant procedures may require general anesthetic; in these patients, careful preoperative evaluation with regard to the degree of ptosis and planned correction is required. Bowman W. Report of a chief operation performed at the Royal London Ophthalmic Hospital for the quarter ending 25th of September 1857. Royal London Ophth Hosp Rep. 1859. 11:34. Fasanella RM, Servat J. Levator resection for minimal ptosis: another simplified operation. Arch Ophthalmol. 1961 Apr. 65:493-6. [Medline]. Beard C. The surgical treatment of blepharoptosis: a quantitative approach. Trans Am Ophthalmol Soc. 1966. 64:401-87. [Medline]. Payr E. Plastischen erfolgreicher ersatz aller 4 auenlinder. Arch Lin Chir. 1928. 152:532. Lexer E. Ptosisoperation, Herstelung der oberlidfalte und herstelung des unterlides durch faszienzugel. Klin Mbl Augenheik. 1923. 70:464. Risdon F. Plastic operations about the orbit. Bull Acad Med Toronto. 1945. 18:139. Tillett CW, Tillett GM. Silicone sling in the correction of ptosis. Am J Ophthalmol. 1966 Sep. 62(3):521-3. [Medline]. McCord CD, Shore JW. Silicone rod frontalis suspension. Adv Ophthalmol Plast Reconstr Surg. 1982. 1:213. Bagheri A, Tavakoli M, Najmi H, Erfanian Salim R, Yazdani S. Comparison between eyelid indices of ptotic eye and normal fellow eye in patients with unilateral congenital ptosis. J Plast Reconstr Aesthet Surg. 2016 Jan. 69 (1):e5-9. [Medline]. Satariano N, Brown MS, Zwiebel S, Guyuron B. Environmental factors that contribute to upper eyelid ptosis: a study of identical twins. Aesthet Surg J. 2015 Mar. 35 (3):235-41. [Medline]. Srinath N, Balaji R, Basha MS. Ptosis correction: a challenge following complex orbital injuries. J Maxillofac Oral Surg. 2012 Jun. 11(2):195-9. [Medline]. Frueh BR, Musch DC, McDonald HM. Efficacy and efficiency of a small-incision, minimal dissection procedure versus a traditional approach for correcting aponeurotic ptosis. Ophthalmology. 2004 Dec. 111(12):2158-63. [Medline]. Zhong M, Jin R, Li Q, Duan Y, Li L, Huang D. Frontalis Muscle Flap Advancement for Correction of Severe Ptosis Under General Anesthesia: Modified Surgical Design with 162 Cases in China. Aesthetic Plast Surg. 2014 Mar 8. [Medline]. Har-Shai Y, Hirshowitz B. Extended upper blepharoplasty for lateral hooding of the upper eyelid using a scalpel-shaped excision: a 13-year experience. Plast Reconstr Surg. 2004 Mar. 113(3):1028-35; discussion 1036. [Medline]. Bellinvia G, Klinger F, Maione L, Bellinvia P. Upper lid blepharoplasty, eyebrow ptosis, and lateral hooding. Aesthet Surg J. 2013 Jan. 33(1):24-30. [Medline]. Cho IC, Kang JH, Kim KK. Correcting upper eyelid retraction by means of pretarsal levator lengthening for complications following ptosis surgery. Plast Reconstr Surg. 2012 Jul. 130(1):73-81. [Medline]. Bernardini FP, de Conciliis C, Devoto MH. Mini-invasive ptosis surgery. Orbit. 2006 Jun. 25(2):111-5. [Medline]. Borman H. New adjustable suture technique for managing eyelid ptosis. Ann Plast Surg. 2001 Dec. 47(6):673-7. [Medline]. Carraway JH. Reconstruction of the eyelids and correction of ptosis of the eyelid. Aston SJ, Beasley RW, Thorne CH, eds. Grabb and Smith's Plastic Surgery. Lippincott-Raven; 1997. 538-44. Finsterer J. Ptosis: causes, presentation, and management. Aesthetic Plast Surg. 2003 May-Jun. 27(3):193-204. [Medline]. Harley RD, Nelson LB, Flanagan JC, Calhoun JH. 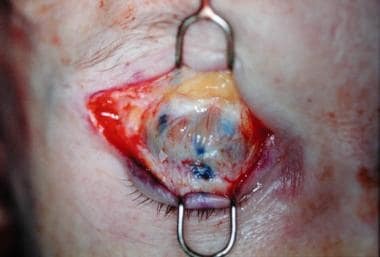 Ocular motility disturbances following cosmetic blepharoplasty. Arch Ophthalmol. 1986 Apr. 104(4):542-4. [Medline]. Jelks G, Smith B. Reconstruction of the eyelids and associated structures. McCarthy J, ed. Plastic Surgery. 1990. 1752-73. Jelks GW, Jelks EB. Blepharoplasty. Complications and Problems in Aesthetic Plastic Surgery. 1992. Jones LT, Quickert MH, Wobig JL. The cure of ptosis by aponeurotic repair. Arch Ophthalmol. 1975 Aug. 93(8):629-34. [Medline]. Lemke BN. Anatomy of the Ocular Adenexa and Orbit. Ophthalmic Plastic and Reconstr Surg. 1987. Mahaffey PJ, Wallace AF. Blindness following cosmetic blepharoplasty--a review. Br J Plast Surg. 1986 Apr. 39(2):213-21. [Medline]. Rycroft B. Tearing: management with transantral vidianectomy. Troutman RC, Converse JM, Smith B, eds. Plastic and Reconstructive Surgery. 1962. Siegel RJ. Advanced upper lid blepharoplasty. Clin Plast Surg. 1992 Apr. 19(2):319-28. [Medline]. Stasior OG, Ballitch HA 2nd. Ptosis repair in aesthetic blepharoplasty. Clin Plast Surg. 1993 Apr. 20(2):269-73. [Medline]. von Graefe CF. De Rhinoplastice. 1818. 13. Whitnall SE. On a ligament acting as a check to the action of the palpebral superioris muscle. J Anat Physiol. 1910. 14:131. Blepharoplasty, upper lid ptosis surgery. Intraoperative photo of levator plication. Upper lid ptosis surgery. Correction of ptosis using blepharoplasty plication of the levator. In addition, the patient had facial rejuvenation and endoscopic brow lift. Blepharoplasty, upper lid ptosis surgery. Correction of ptosis, with incomplete correction of asymmetry.